Owen Guthrie (left), acting eCampus director, and Devin Drown (right), a faculty member in the Department of Biology and Wildlife, share their insights about online education. 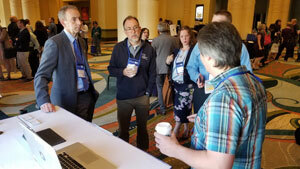 UAF eCampus staff and Devin Drown, a faculty member in the Department of Biology and Wildlife, presented at the Online Learning Consortium (OLC) Accelerate conference in Orlando, Florida on Nov. 16. OLC Accelerate is devoted to driving quality online learning, advancing best practice guidance and accelerating innovation. UAF staff and faculty presented about creating rich media for courses and developing online programs.